A Wonderful Extension to the Child’s Experience After the Montessori School Day is Over. At the end of the work day, we understand the importance of continued exploration in self-discovery. Our school days are full of rigorous academics, so time after school allows for exploring other interests of the child. Music, art, and gymnastics are just a few extra-curricular activities that many families explore, encouraging their children to find joy through creativity, play, and exercise. We are fortunate to have a variety of enrichment programs available to families for the end of the school day here at school. Many talented individuals have brought their passion and expertise in the form of extra-curricular classes, expanding our students’ knowledge and exposure to everything from art to yoga. As an Alden family, you will have the opportunity to access these enrichment activities. 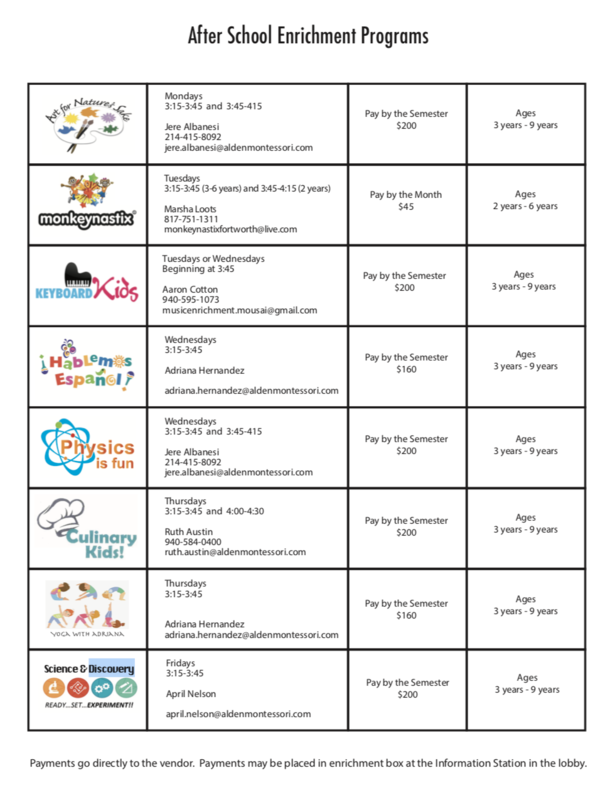 Prices vary by program. A full list of these optional classes can be obtained from the school.